A key figure in the history of Benares (Varanasi), James Prinsep (1799-1840) was instrumental in expanding Western knowledge of Indian civilisation. After briefly studying under Pugin, he became an assay master in Calcutta in 1819, and soon moved to Benares. His talents were many, and within a few years he had completed a detailed map of the city, designed a new mint, engineered a system to improve sanitation and begun studying the inscriptions and coins that helped him to decipher two ancient scripts and to establish the dates of Indian dynasties. Collected in 1858 and edited by the numismatist Edward Thomas (1813-86), these essays are generously illustrated, often in Prinsep's hand, and display the enormous breadth of his knowledge. 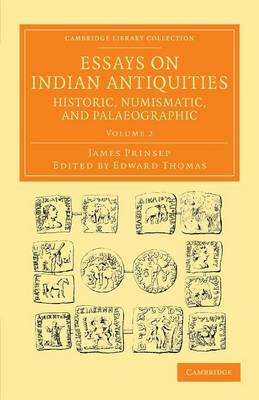 Volume 2 includes essays on coins and philology, with the extensive tables and lists of historical weights and measures, and explanations of Indian chronology.